1'-Oxoelemicin is a theoretical metabolite of elemicin proposed by Peele Jr., and Edward O. Oswald. 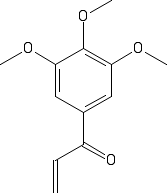 Peele Jr., and Edward O. Oswald theorized that this metabolite can condense with dimethylamine, piperidine, or pyrrolidine forming one of 3 possible psychedelic alkaloid metabolites. Corresponding 1'-oxo metabolites have been found for the closely related 1'-hydroxy metabolites of safrole, methyl eugenol, and methyl chavicol. For more details see the Oilahuasca Activation article. 2. Physiologically based biokinetic (PBBK) modeling of safrole bioactivation and detoxification in humans as compared with rats. 3. Metabolism of methyleugenol in liver microsomes and primary hepatocytes: pattern of metabolites, cytotoxicity, and DNA-adduct formation. 4. Use of physiologically based biokinetic (PBBK) modeling to study estragole bioactivation and detoxification in humans as compared with male rats.